AthTek Skype Recorder concentrates on providing high-quality Skype call recording service. It works on Windows XP, Vista, Win7 and Win8 systems and help users to record Skype calls automatically. It has been awarded as THE MOST NEEDED MATE FOR SKYPE by thousands of users. If you are looking for a Skype recording software, AthTek Skype Recorder should be the final solution for you. AthTek Skype Recorder comes with a clean interface and integrates audio/video call recording, automatic answer machine and parental control on Skype in one program. It can automatically start with Skype and record Skype calls in high-quality audio formats including MP3, WMA, OGG and FLAC. It can also record Skype calls in high-quality video format as AVI files automatically. You can make the Skype recording to be invisible from your screen by using the Silent Mode. 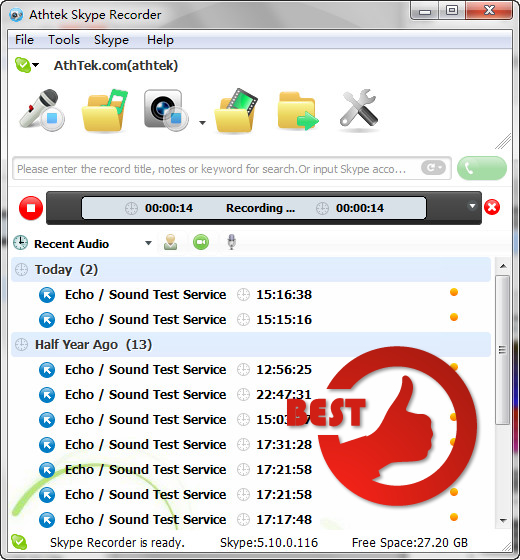 AthTek Skype Recorder will get all the recording works done automatically for your sake. 1. Record Skype calls in high-quality audio and video formats. AthTek Skype Recorder has the best Skype call recording quality. That is why so many enterprises use AthTek Skype Recorder for customer service or Skype interview. 2. Automatically record Skype calls on both sides. It is an intelligent Skype call recorder with no manual operation is required. You can set the audio recording to be saved into different audio track for further editing. 3. Supports parental control. You can run AthTek Skype Recorder in Silent Mode (Stealth Mode) which will totally hide the recording process from your computer. It will help a lot in parental control on Skype. 4. Supports automatic answer machine features. You can add contacts to different groups and make automatic answers to the groups separately. It is highly recommended to download and try AthTek Skype Recorder for free, then you will find it is exact the software you need to keep records for your Skype calls.